The Arabian horse industry in the United States has lost an icon with the death of breeder Ruth “Bazy” Tankersley of Arizona. For 71 years, Tankersley ran one of the country’s most successful and well-respected Arabian breeding programs at her Al-Marah Arabian Horses. She passed away peacefully at her Tuscon home on Tuesday, Feb. 5, 2013 at age 91. Tankersley came from a prominent Chicago family. Her mother, Ruth Hanna McCormick, was a member of the U.S. House of Representatives and her father, Joseph Medill McCormick was elected once to the House of Representatives and once to the U.S. Senate. Her father’s family owned several newspapers, including the Chicago Tribune. Tankersley herself spent time in the family business, working as publisher of the News-Tribune in Illinois and the Washington (D.C.) Times-Herald, bringing her Al-Marah operation with her. But her heart was in Arizona. 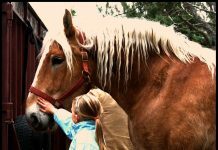 Ultimately, Tankersley returned to Arizona permanently and continued her work with the Arabian breed where she meticulously selected bloodlines to breed the best Arabian sport horses possible. 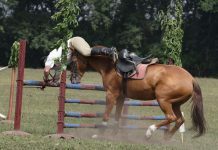 Her star stallion was Indraff, son of the legendary *Raffles, whose name appears in the pedigree of champion Arabians in the halter, reining and sport horse disciplines. While trends came and went in the American Arabian horse industry, Tankersley stood strong on the standards she set for her horses. Alongside Tankersely’s passion for breeding Arabian horses was her passion for education. She started two schools in the Eastern U.S. during her time away from Arizona, and founded the St. Gregory College Preparatory School in Tuscon in 1980. She combined her two loves with Al-Marah’s noted apprentice program. The two-year program employs approximately 12 college-age apprentices who learn all aspects of breeding, management and training of young horses and can earn credit for their work with the Pima Community College. She is survived by two children, two step children, six grandchildren and two great-grandchildren. 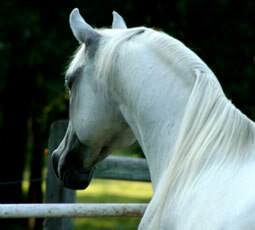 Learn more about Bazy Tankersley and Al-Marah Arabians at www.al-marah.com.